Don't you hate it when your burger bun melts in your hand, leaving you to juggle a partially eaten patty and condiments while juice runs down your arm? Some restaurants provide sturdy buns, but often they are as wimpy as grocery store offerings. 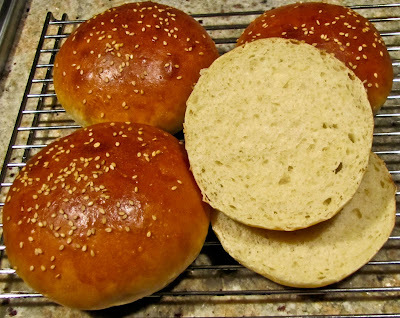 Kaiser rolls from local bakeries are more substantial, often too substantial and heavy. I really crave a soft interior to soak up the juices and a nice crust to hold it all together. In the spirit of adventure - and to avoid a morning's scheduled activity of organizing drawers and closets - I set out to produce a really good burger bun. Effort #1 was so successful, I'm not sure I want to try any other recipes. This bun was everything I wanted, light yet sturdy and absolutely delicious. It held up nicely to the challenge of a really juicy lamburger. The recipe should be awesome, considering it's recent history. I found it via a Google link to Annie's Eats, and her post on The Perfect Bun. Annie credited Smitten Kitchen for the recipe. Deb of Smitten Kitchen considered 100+ bun recipes before settling on Light Brioche Burger Buns, a recipe published in a New York Times article on The Perfect Burger but credited to the kitchen at Comme Ca, a restaurant in Los Angeles. Doesn't that make your head spin? My breadmaking usually involves French baguettes and no-knead or sourdough boules, breads with texture and presence. 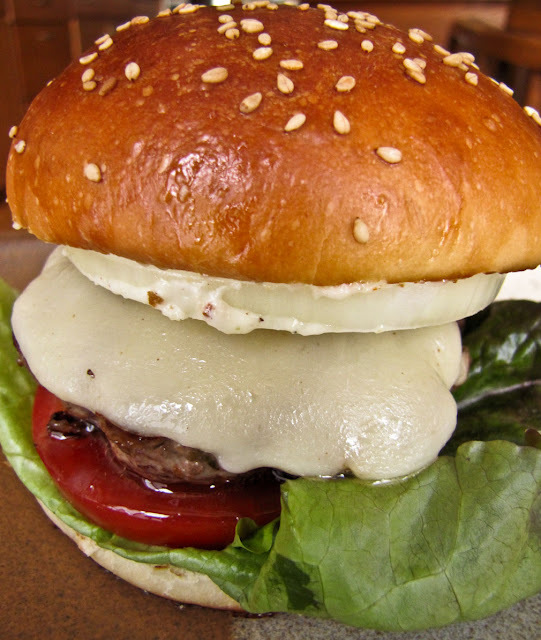 Light and brioche were unfamiliar concepts but why would I argue with the brioche burger buns' stellar provenance? I did tweak the recipe a little by adding some of my sourdough starter to the mix, but it wasn't necessary. I love the tang of sourdough, but the slightly sweet flavor of the brioche was terrific without any tang. These burger buns are winners without changing the recipe one bit. 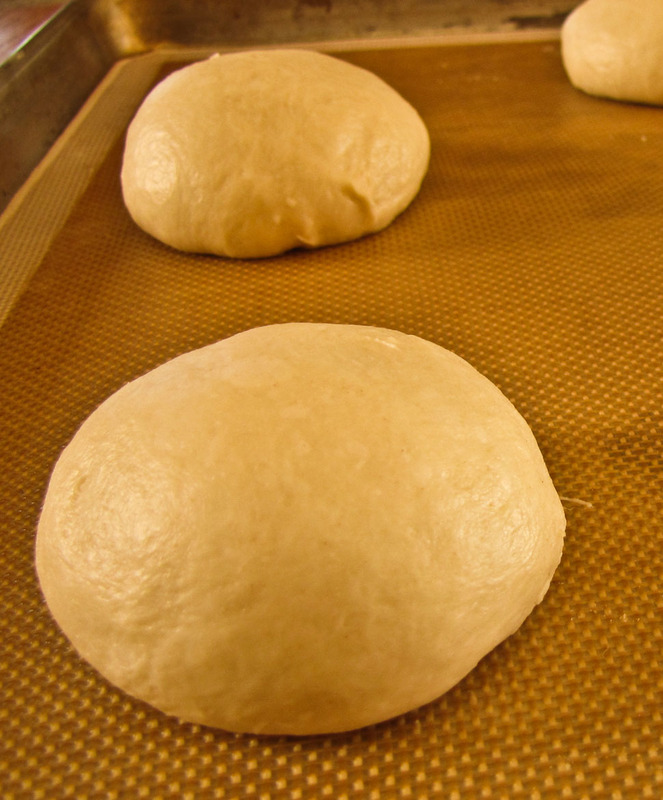 Following the first rise the dough was shaped into small buns. Covered with oiled plastic wrap, waiting for the second rise. Fresh from the oven - don't they look scrumptious! The glossy brown top crusts cover light and airy interiors. Use a stand mixer fitted with the paddle attachment; combine the milk, water, yeast, sourdough starter if using, sugar, salt and 1 egg. Mix briefly to combine. Add the flour to the bowl, and mix until incorporated. Mix in the butter. Switch to the dough hook and knead on low speed for about 6-8 minutes. The dough will be soft and tacky, but adding too much extra flour will make the buns tough. Line a baking sheet with parchment paper or a silicone baking mat. Use a dough scraper to divide the dough into 8 equal parts. 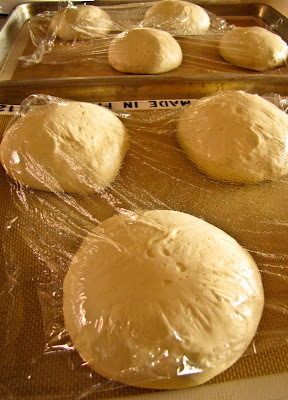 Gently roll each portion of dough into a ball and place on the baking sheet, 2-3 inches apart. Cover loosely with lightly oiled plastic wrap and let rise again, 1-2 hours, until puffed up and nearly doubled. 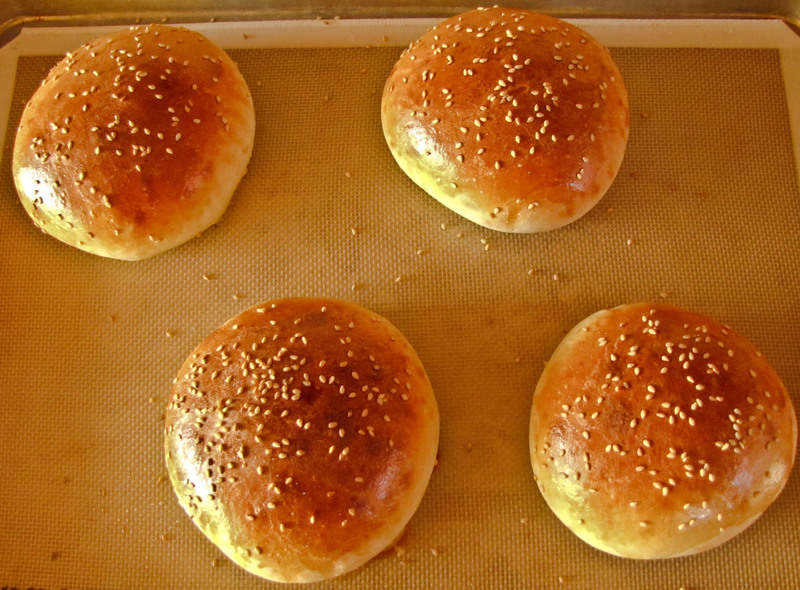 Slice and enjoy... you're going to love these burger buns!